Cambridge College BA in Psychology student Jerry Pinto is the 2018 New Bedford Man of the Year. For him, it’s the good feeling he gets when he sees a smile on the face of a parent or child, a smile that he helped put there. Piles of money are nice, but it doesn’t make you feel good, he said. “It’s that little kid, father, mother, who remembers you,” the 47-year-old Pinto said. That’s what warms his heart. For eight years now, Pinto has collected thousands of toys as part of his Safe Zones Fill The Bus Toy Drive for the benefit of children across SouthCoast and beyond. The program started in New Bedford, but has expanded to Dartmouth, Fairhaven and Acushnet the last three years. “We’ve given (toys) from Wareham to New Bedford, and last year we sent 30 backpacks to Guatemala,” he said. 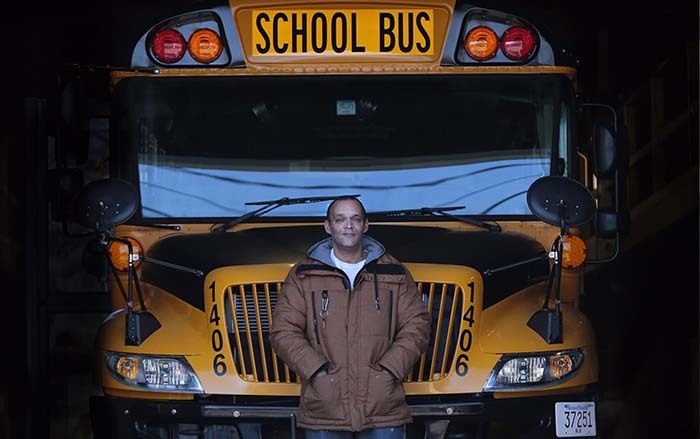 He organizes the toy drive in addition to working on his bachelor’s degree, improving people’s lives in New Bedford as head of Neighborhoods United and working full-time as a school bus driver. “I just feel that no kid should go without one gift at Christmastime. I know I’m not going to get them all,” he said. As a result of his generosity and kind spirit, Pinto is The Standard-Times 2018 New Bedford Man of the Year. Pinto had a tough childhood and that’s what motivates him. “I understand both sides, man. Having an understanding of what it’s like to be that kid is a whole ’nother thing,” he said. Ken Resendes, head of the Bullard Street Neighborhood Association, and Pinto have been friends for years and they work side by side with Neighborhoods United. He said his friend is “a go-getter” and “a do’er,” who works hard to help people. Pinto is proud of the toy drive, saying it brings people together. “The toy drive is a great example of the power in numbers.” The thousands of toys he gathers have to be collected, sorted and distributed. About 130 volunteers are involved. Dartmouth Detective Kyle Costa remembers the first time he met Pinto. It was “a cold call” that Pinto made a few years ago to see if Dartmouth police were interested in participating in the toy drive. Fairhaven Lt. Kevin Kobza feels the same way. “His sense of community doesn’t end at the borders of New Bedford. His energy is boundless,” he said. Pinto credits his wife, Ana Pinto, with helping him juggle the many hats he wears.